After such a successful first season of PHT we have already started the second one. The second Tournament was played at the TPUE Club sports facilities in Unterengstringen. Even with a lot of cold, the fanatical players gave an unforgettable spectacle of sportsmanship. Congratulations to the players and the winners. The PHT Team. Our second tournament in the popular PLAY PADEL PRATTELN sports facility. In the 1st category it was exciting until the last GAME…all wanted points for the desired WORLD PADEL TOUR – Wild Card. The good and pleasant atmosphere was very well received by the players. Thanks to all, the HPT Team. A sporty and exciting Hack`s Challenger tournament in the Indoor Padel – Sportcomplex Play Padel Pratteln. Wonderful atmosphere in a familiar and sporty community. A successful MASTER of the Helvetia Padel Tour in the sports facilities of the Club TPUE in Unterengstringen. First INTERLEAGUE of Helvetia Padel Tour in the sports facilities of the Club PADELARENA in Wädenswil. First OPEN of Helvetia Padel Tour in the sports facilities of the Club TPUE in Unterengstringen. We are proud to say that now you can play Padel in Basel!!! In February, the Padel Basel Club got a new indoor court of the company Padel Helvetia. The black Technic court with the special pink grass had an amazing welcome by all the members. 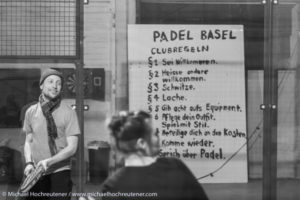 But Padel Basel is more than just Padel; from the very beginning you will feel welcome, getting to know lots of cool people and having an amazing time. Just check their padel rules, can you feel the good vibes? Während des Monats Juni wurde in der SPORTANLAGE SONNENBERG der Padel Court “Total View” aufgebaut. Der von der Schweizerfirma Padel Helvetia GmbH installierte Platz (Court) zählt zu den Besten aber auch schönsten Courts weltweit. Jessica & Phillippe Hofmann organisierten eine super Einweihungsfeir und überaschten alle Anwesenden mit einen spannenden Match mit Spieler des Nationalen Schweizer Padel Team. Alle Anwesenden wahren begeistert von dieser hier bei uns noch neuen Sportart.